I decided to leave it out. Do you have some vintage Valentines? Bernideen, I love all your decorations. It' my favourite style. I have one vintage Valentine. I've been working on some decorations. I will be blogging them soon take care and enjoy. Your vintage Valentines are absolutely wonderful!Your home is cozy and beautiful and your red transferware always makes me smile...Fabulous!I also love your header.Blessings,dear Bernideen. I have a few vintage Valentines but not nearly as many as you, Bernideen. We don't really decorate for Valentines here in Australia. Your home looks beautiful with the pretty Valentines dotted here and there. 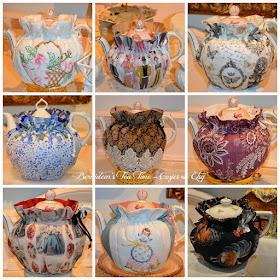 They sprinkle a touch of whimsy to your lovely home. The little rabbit box is very sweet. Love your red transferware. I would leave it out for a while longer, too. 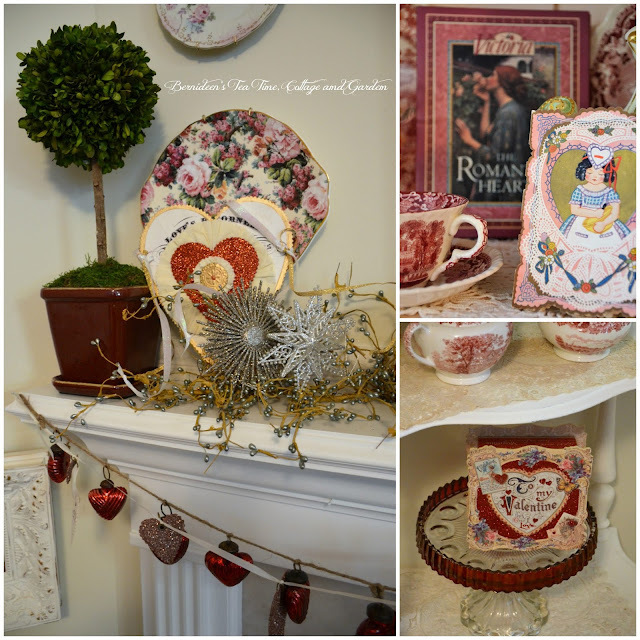 The red transferware looks so pretty for Valentine’s Day and with your Valentines tucked in. I do have a few vintage Valentines, but it is unlikely that I will go looking for them between now and then. 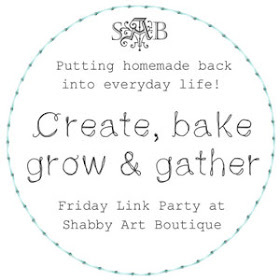 Stay warm and keep having fun crafting. Your Valentines are adorable! Like you, I prefer the look and history of old things. A Valentine postcard sent to my Mother by her elementary school teacher, plus a few given to me during exchanges long ago in school, are my treasures. Have a blessed Valentine's Day! Beautiful, Bernideen! I like those glitter hearts you have next to the potted topiary's, did you make those? It is cold isn't it?! Hot tea has been nice! Love the Valentines, Bernideen, and your display of red transferware! What fun to have a hearth room next to the kitchen. Your home is warm and filled with lots of character. I do not have any valentines from my school days but I have every card ever given to me by my family, including valentine cards. Those go back a ways. I just can't seem to part with them. Stay cozy! Bernideen, I need a kitchen hearth room. I don't know why, because wood fires give me respiratory problems! But still, I love the look of a fireplace. Dear Bernideen, Your hutch filled with your red transferware and vintage valentines is so Beautiful! I love the old valentines Too. They bring back happy times of grade school. I enjoyed this post so much! 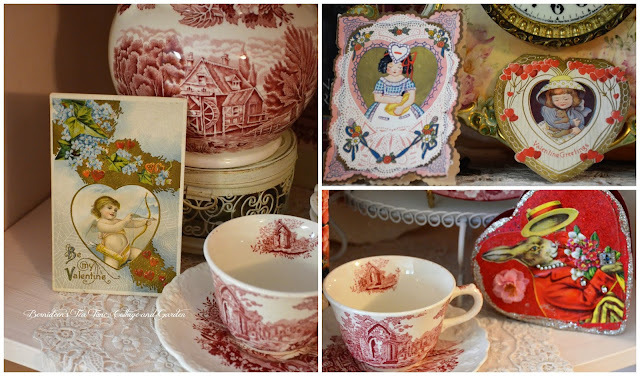 Love your vintage Valentine's and the red transferware really set them off! I collect Victorian Valentines and especially love the ones that open up with the little honeycomb paper inside. A quilting friend of mine gave me a whole bunch of her Valentines she received back in elementary school. She is in her 80's. My most treasured one is a Valentine my grandfather sent to my grandmother during their early married years. Your Valentine decor is lovely, Bernideen. I'm swooning over your gorgeous red and white transferwares.